NASA announced today in a news briefing its next Discovery-class missions will be Lucy and Psyche. The missions will study an array of unexplored asteroids, with Lucy embarking on a tour of Jupiter’s Trojan asteroids and Psyche setting course for the metallic asteroid 16 Psyche. “Small bodies are really the fossils of planetary formation,” says Hal Levinson, a planetary scientist at the Southwest Research Institute and Lucy’s principal investigator, in a NASA press conference. The final missions were selected from a list of five semi-finalist missions with destinations that also included missions to Venus and a near-Earth object monitoring spacecraft called NEOCam. Lucy is scheduled to launch in 2021 and will explore a total of seven asteroids between 2025-2033 during its prime mission. Between 2027-2033, Lucy will explore six Trojan asteroids that lead and trail Jupiter’s orbit at its L4 and L5 Lagrange points. “One of the surprising aspects about the population is its diversity in color and spectra,” says Levinson. “In the history of unmanned exploration we have only visited six main belt asteroids, and that has revolutionized our understanding of the solar system,” says Levinson. Very little is known about Jupiter’s Trojan asteroids, but they are thought to be captured asteroids, comets, or even Kuiper Belt objects hailing from beyond Neptune’s orbit. Studying the Trojan asteroids will lead to new insights not only into the asteroids themselves, but also to the Solar System’s early history. “It’s the last never-before-explored population of objects this side of Pluto,” says Alan Stern, New Horizons’ principal investigator. The mission builds on the work Stern and his team did for New Horizons: According to Stern, much of the team and instrument payload are direct carryovers from the Pluto-bound mission. Lucy is to be built by Lockheed Martin Corporation and led by Harold Levison of the Southwest Research Institute in Boulder, Colorado. 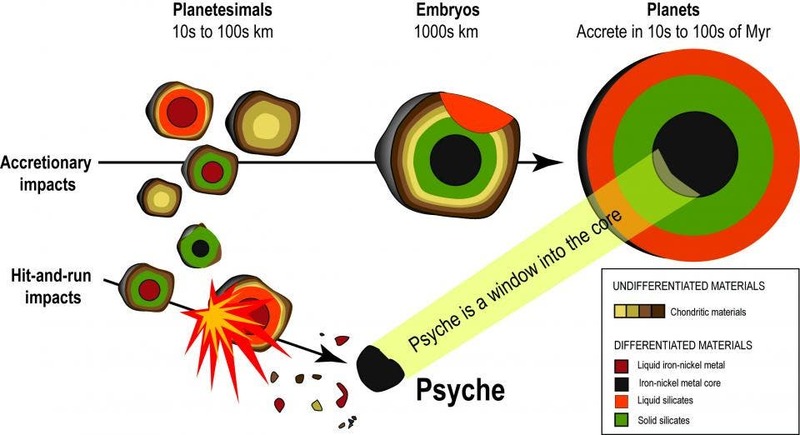 Launching in 2023, Psyche will arrive at its namesake asteroid in 2030. 16 Psyche is a metallic asteroid thought to be the remnant core of a planet about the size of Mars but was nearly obliterated due to several sustained, large impact events early in the Solar System’s history. Studying Psyche will reveal details about a little-understood class of asteroids and could yield insights into the internal composition of other terrestrial planets, such as Earth and Mars. Pysche will be built by Space Systems Lorel of Palo Alto, California and operated by Arizona State University in Tempe under “This is the only time a human being is ever going to see a core,” says Elkins-Tanton, Psyche’s principal investigator and planetary scientist at Arizona State University. “The best we’ve ever imaged it is as a point of light. We don’t know what a metal world—its cliffs, its mountains, its impact craters—is going to look like.”. In addition to selecting Lucy and Psyche, NASA will extend funding for the Near Earth Object Camera (NEOCam) project – another one of the five semi-finalist Discovery mission concepts – for an additional year. NEOCam is a space telescope designed to survey the regions of space closest to Earth for potentially hazardous asteroids. NASA’s Discovery mission directorate seeks to fund relatively lower-cost missions to undertake more specialized science investigations. Their development costs are capped at $450 million. Previous missions in this program have included the Mars Pathfinder mission, MESSENGER to Mercury, the currently operating Dawn spacecraft orbiting Ceres, and the upcoming InSight Mars lander, which is due to launch in May 2018. "There Could be At Least Two Unknown Planets Hidden Well Beyond Pluto"
"It Came from Outer Space" –Crowdsourcing Asteroids Via "The NASA Challenge"
Today's 'Galaxy' Insight –"Life in the Milky Way"